For a change of pace, I am going to take a look inside the pages of a 1976 NFL game program. PRO! was the official magazine of the NFL which the league produced and sold at stadiums on game days. I bought this publication when I attended the 10/31/76 Eagles-Giants contest at Giants Stadium (the third-ever regular season game at this new venue). 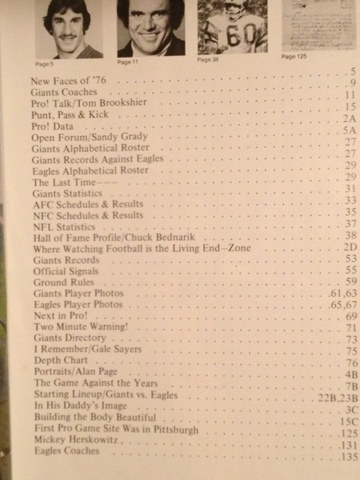 The issue is labelled Giants Edition and has a cover price of $1. While the program contains a number of color photos, a sizable percentage of the pictures are black-and-white. As one might expect, the program contains basics such as team rosters, schedules, and statistics. But I'd like to focus on some of the more interesting content. My favorite piece is the PRO! Talk feature which has a conversion with Tom Brookshier who was in his second full season as the #1 analyst on the CBS telecasts. That article focuses on Brookshier's broadcasting career which started on Philadelphia radio in 1962. It includes a detailed recap of his infamous Duane Thomas "Evidently" interview during the Super Bowl 6 postgame show. The story also covers his TV partnership with Pat Summerall which began with the syndicated NFL Films highlight show This Week in Pro Football. The interview also delves into the decision by CBS to pair this duo together midway through the 1974 season and Brookshier shares his perspective on their early days as a booth tandem. Brookshier incorrectly recalls their first telecast together as being a Giants-Cardinals game in St Louis. (The opponent that day in St Louis was actually the Redskins.) Brookshier also describes the day that he and Summerall were awarded the Super Bowl 10 booth assignment and spends several paragraphs recapping that telecast from January of that year. 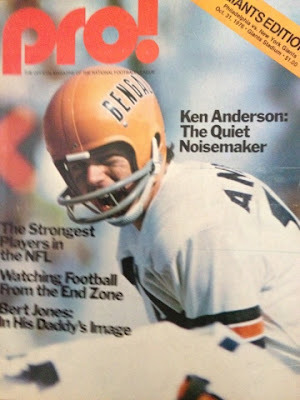 Bert Jones and cover subject Ken Anderson were among the active players profiled in the issue. There is also an article on the strongest players in the NFL. That story which attributes the increased strength to weightlifting and Nautilus training reads eerily now with the hindsight of the steroid use in the sport at that time. The program also contains retrospectives on retired stars such as Chuck Bednarik and Gale Sayers and a look back at the 1962 Texans-Oilers AFL Championship game with the infamous Abner Haynes declaration "we'll kick to the clock" after winning the overtime coin toss. a preview of the next edition of PRO! The magazine contains 136 pages, but much of the space is occupied by a mix of local and national advertisements. The full-page ads include 1970s mainstays such as Zenith, Dodge, Chevrolet, Chrysler, Taster's Choice (freeze dried coffee), Getty (gasoline), Salem (cigarettes), Skoal (smokeless tobacco), Schlitz (beer), and Cutty Sark (whiskey). There is also an ad for Bibb NFL officially licensed sheets and pillowcases. One of the local ads bills The Record as New Jersey's largest evening newspaper (bringing back memories of a time when certain papers would hit newsstands in the afternoon). 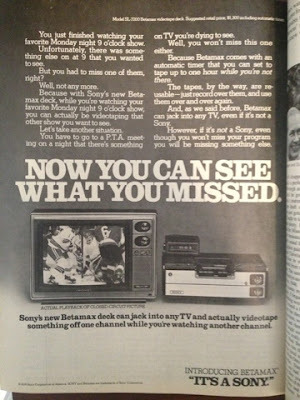 I found it quite fascinating to look back at the technology ads from that era. 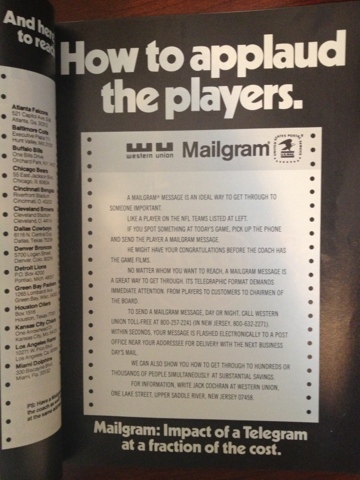 Western Union took out a large ad for its mailgram service (1970s Twitter anyone?). Promising next business day delivery, it encourages you to send a mailgram to an NFL player and lists the mailing addresses for all 28 league teams. Royce Electronics promotes their latest CB radio. Panasonic ("just slightly ahead of our time") pitches portable cassette tape recorders in one ad and highlights 19" TVs in another. And Sony has a full-page spot on the new Betamax deck (sort of a 1970s version of a DVR) with a suggested retail price of $1,300!! In the pre-internet days, publications would often contain several mail-in offers. 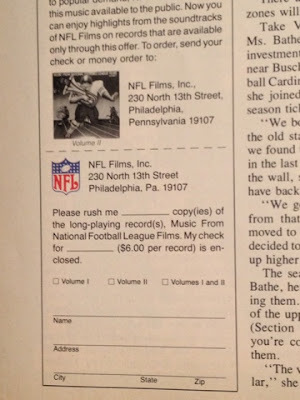 The magazine has a mail-order form for purchasing one or both volumes of an NFL Films music soundtrack for $6 per LP record. 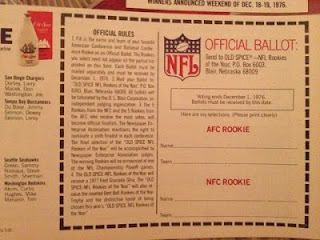 Another one enables you to pre-order an official Super Bowl 11 program ($2.50) or poster ($1.75). 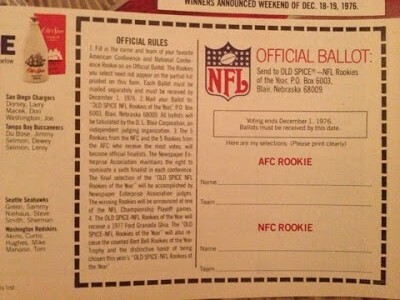 There is also a clip-out ballot for voting on the AFC and NFC rookie of the year sponsored by Old Spice. Search "NFL Films music" on sites such as Amazon.com for options to buy (CD and/or vinyl).